Why is my friend faster but trains less? A big topic that comes with training is your recovery. This takes almost just as much discipline as the actual training and can be improved by a lot of things (reduce stress, increase amount of sleep...). When you logg into your 2PEAK account, you can see a battery icon in the top right hand corner. This article is all about explaining what happens behind this battery, what it stands for and how you can use it to your advantage. If you hover above the 2PEAK battery icon with your cursor, it shows you how many hours you have left until you are fully recovered. Training on tired legs is an important part of improving your form, so, your battery will always be some sort of “used” while you train (and will fully recover as you get to the starting line of your next race). But 2PEAK monitors your load and recovery constantly, to make sure that you never get too low for too long ( or "too full") on your recovery therefore helping you to avoid overtraining and injury. That is why you might find that on some days where you would have a lot of time to train, 2PEAK sends you to do an easy workout to help you recover. The battery symbolizes your recovery index, meaning it reflects the load from your logged training. 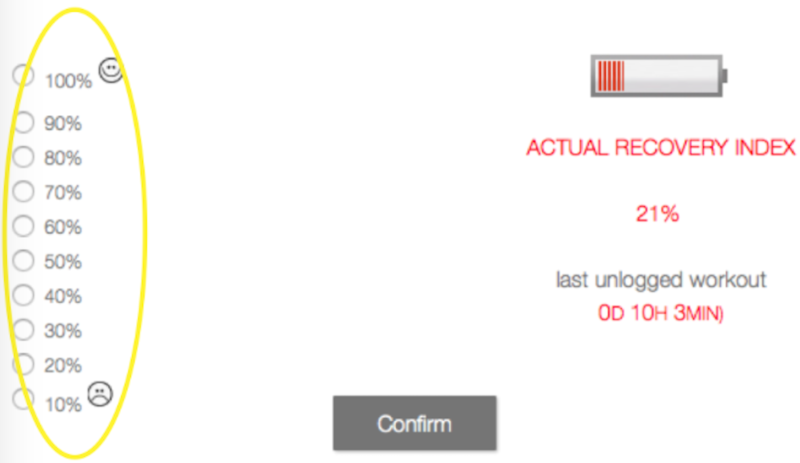 Your recovery time is displayed based on your recovery ability as we explain below. When you click on the battery you can adjust your index manually. So if you don’t agree with your recovery index (which is represented by the battery) you can adjust it to reflect your perception and 2PEAK will re-calculate your training based on your corrections. So while 2PEAK keeps track of objective paramters such as training load, you can adpat the index to psychological or emotional influences which are not measurable. We've added a new cool feature to the battery which is that we've recently updated our calendar view for the phone App and the Web to include your recovery level after every single planned workout for the rolling two weeks. This allows you to get a feel for the importance of proper recovery in order to execute your planned workout and adapt , so become stronger. It also shows you the demand of your upcoming workouts in terms of training load and allows you to adjust your battery (click the battery and adjust the level), should you feel different than what 2PEAK has calculated for you. 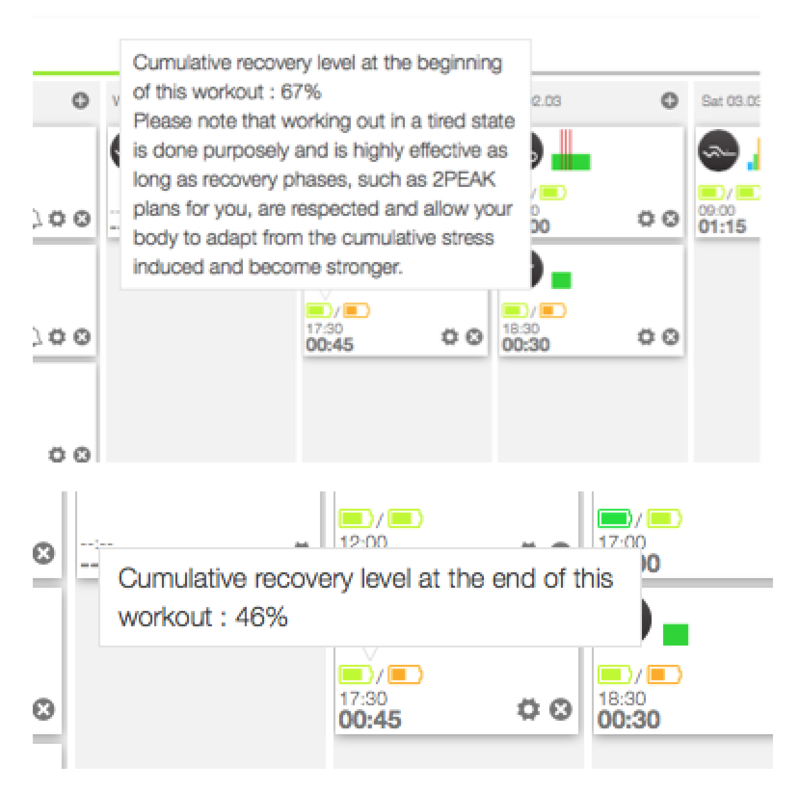 Please note that the recovery level seen ahead of each workout is always cumulative i.e. it represents the stress you have accumulated over the last 10 days. Please also note that it is often intentional to begin a workout when not fully recovered, as it is highly effective to train on tired legs. As long as recovery phases such as 2PEAK plans for you, are respected. Recovery blocks will ensure your body does adapt and becomes stronger. Now that we’ve covered the general meaning behind the “2PEAK battery”, we’d like to talk a little more in depth of what happens behind it. All the way in the beginning, we put you in a cohort with other athletes who have the same training age (which is NOT equal to your biological age) but as soon as you start documenting your training and you adjust your recovery index, we learn more and more about your individual and specific recovery ability. Over time everything gets more precise and custom tailored to you. While on one hand the load may be the same for everyone (20 minutes full are just as hard for a pro as for you, it’s just that he gets further/ is faster), on the other hand the recovery ability is very different. Partially you can optimize it through training but it also depends a lot on your genetics, which you can’t influence that much. The amazing thing about 2PEAK is that you can find your optimum just by the click of a button. We hope you have a good time recovering, make sure to let us know how you’re feeling by clicking on the battery icon.